Want your overnight guests to feel at home this Christmas? Follow these simple steps to make their stay comfortable and enjoyable. Are you hosting the Christmas festivities this year? If you’ve done this time and time again, there probably isn’t too much that concerns you. For many, that simply isn’t the case. We worry about getting the house decorated in time, whether or not there will be enough food, where everyone will sit when it comes time to eat, and how to keep everyone entertained the whole time they’re here. For me, the biggest solution to this kind of holiday stress is planning ahead. If there’s one thing that’s overlooked this time of year, it’s the guest room (or sleeping quarters). Speaking from experience of spending Christmas away from the comfort of my own bed every year, I know how important it is to get a good night’s sleep and feel relaxed over the holidays. There’s nothing worse than waking up hour after hour, suffering through Christmas Day because you’re exhausted. From a hostess’ standpoint, it’s much easier to have everything prepared before guests arrive so you’re not hunting down fresh towels or toiletries while you’re in the middle of stuffing the turkey. Am I right? There are a few simple details you can take care of well before your overnight guests arrive to ensure everyone feels comfortable and more at home. Now’s the time to get started so you’re ready with plenty of time to spare! Start with a comfortable bed. With so many great options at various price points, forgo the old worn out mattress. We recently upgraded our mattress and can’t believe the difference it has made. There are many mattress options at various price points, so shop around. If you don’t have a headboard, consider creating an inexpensive upholstered one. 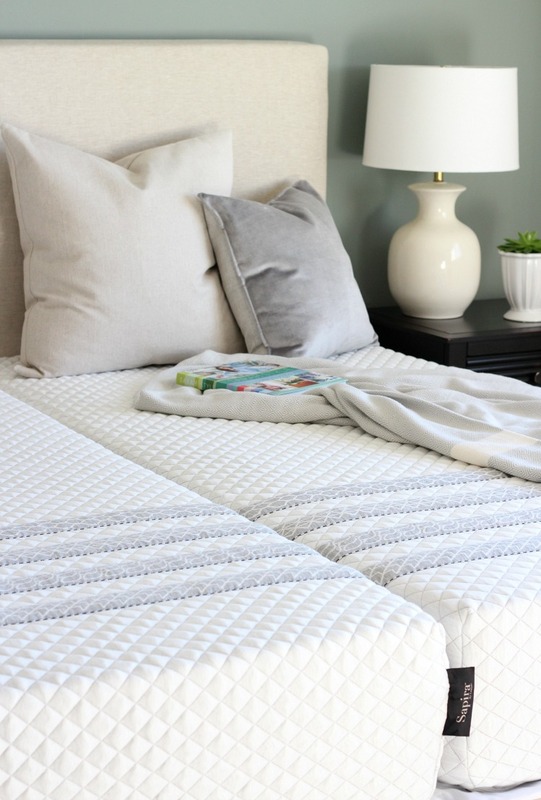 Layer good quality cotton or linen sheets, a coverlet, and a duvet. Supply two types of pillows, including one that’s a bit firm for side sleepers and another on the softer side for back or stomach sleepers. 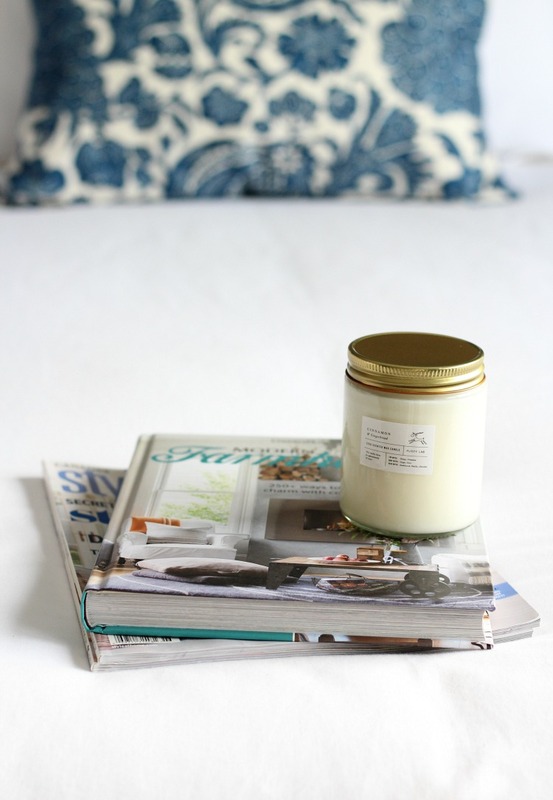 Provide a bedside table with all the essentials. Guests may be careless with water glasses, so choose something low maintenance, such as a painted finish or glass top. As well, try to find one with a drawer for extra storage and large enough to be fully functional. Leave a clock (with alarm and music option if possible), water carafe and glass, as well as a great reading lamp on the nightstand. Supply a small assortment of reading materials, such as short stories, coffee table books or magazines. Remember to keep your wifi password handy. 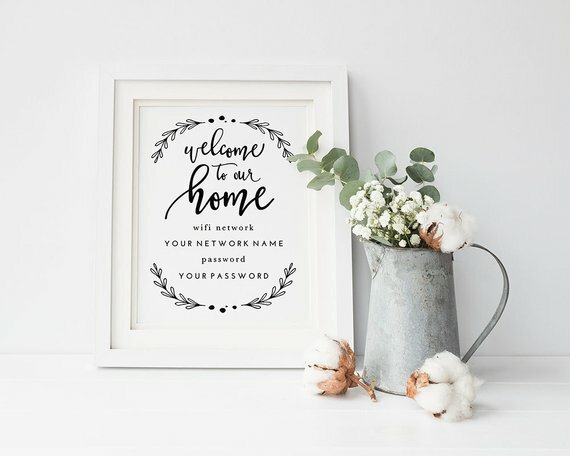 This hand-lettered printable from Tumbalina Studio is lovely way to display it. Create an area for clothing. If you don’t have a closet with extra hangers, use a small coat rack or hang decorative hooks on the wall. A small storage ottoman or bench is convenient to hold extra supplies or luggage. If you’re low on space, simply add baskets that can be pushed to the side. Pamper your guests with homey details. A basket filled with washable slippers or fluffy socks, toiletries, fresh towels, and even some snacks will elevate their experience. 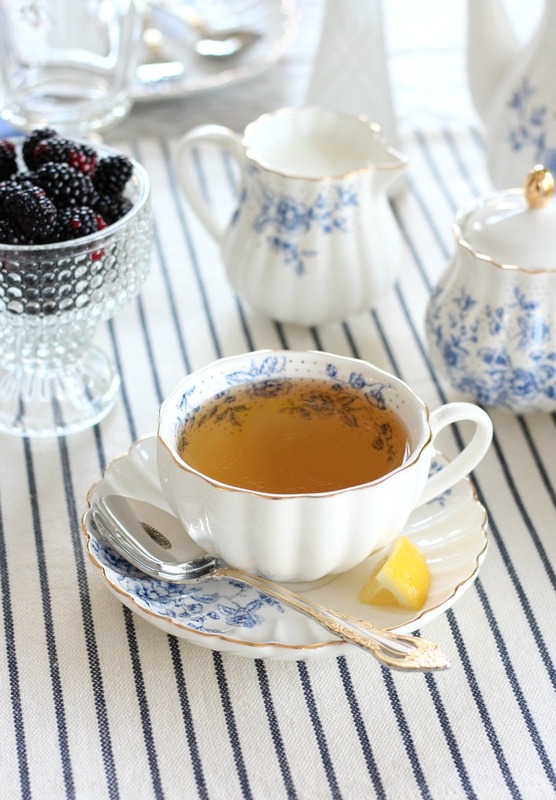 Consider leaving a teapot with tea bags or a coffee maker nearby with the essentials if your guests are early risers. Finish off with a holiday feel. Fresh flowers or plants, such as snow white amaryllis or paperwhites, add an element of pretty to any space. 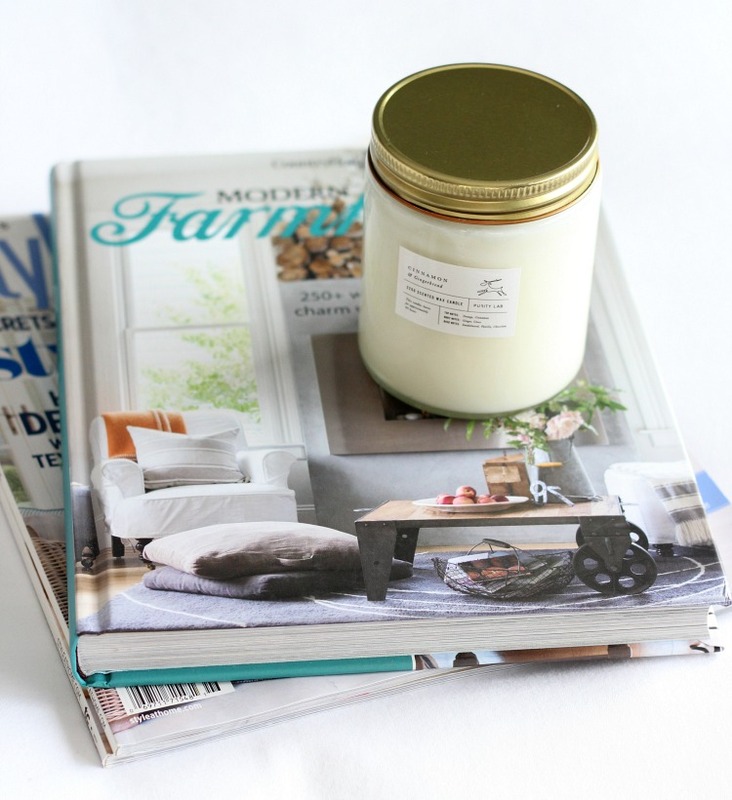 Add a candle (in a container or jar is safest) for a bit of ambiance and subtle scent. As an option, fill a vase with sparkling ornaments for a stunning look. Whether you go “all out” or just add a few small touches, remember that your guests will only feel as comfortable as you do. Take care of yourself to ensure you have the energy to enjoy your time with them too. After the festivities, do something to rejuvenate yourself and take the time to reflect on the moments of the holidays. Believe me, your generosity won’t go without notice.